Our perceptions of the age of an object are frequently based on our common experience but I have found that for many people those common experiences are of little help when it comes to examining objects for which a person has no experience at all. A couple of years ago this really hit me as I was trying to get a group of student to think about the nature and significance of historical science. I was teaching a senior seminar course in our honors college. There were 18 students with a wide range of majors of which only one was in the physical sciences. My primary example was the natural history (geology and life) of the Hawaiian Islands but I started the class with a homework assignment that required that they each go to the Mars Rover JPL/NASA website and look at the raw images feeds from the Opportunity and Spirit rover both of which were actively imaging Mars at the time. They had to pick one picture which they were required to download and send to me. Along with that image they were to include a one page description of what they imaged was the series of events that must have taken place to produce the scene that was before them. I also asked that they make an educated guess as to how long age each historical event took place. For the next class I took the images that they students provided and put them into a PowerPoint presentation and each student had to briefly tell the class what they proposed was the history of the objects in the image. This was my way of getting them to think about the scientific method and think about time. Most of them picked pictures of various craters or large rocks on a sandy landscape. The usual timelines included the formation of the underlying rock strata, the origin of the sands and the timing of any impact craters followed by further erosion. What was most interesting about the responses was the utter lack of any perception of how long each of these steps would take. This was especially true when considering the erosion of the rocks in the images. The crater in the picture at the top appears rather “fresh” but what about the one below. 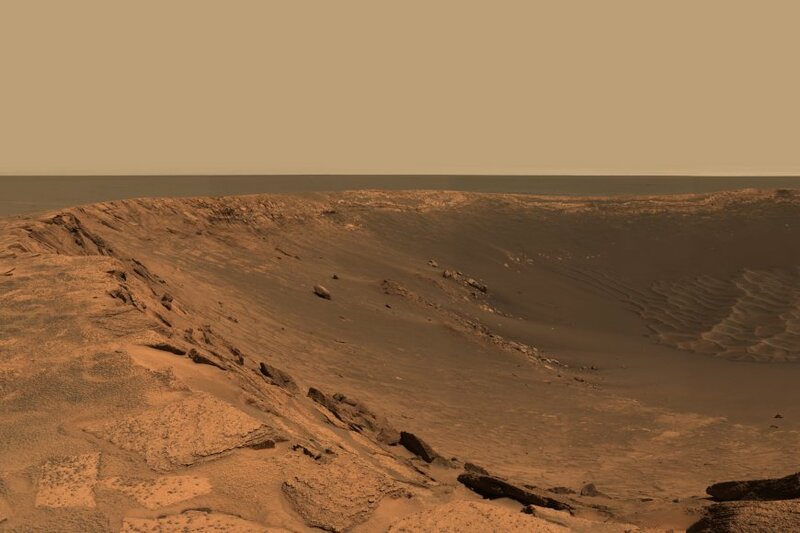 This is Endurance crater and was the first large crater that the Opportunity rover was able to visit. Eventually it visited a much larger crater, Victoria, and now has been inside an even larger crater for the last two years. If I remember right in the written assignment, which was due before we talked about Mars at all, there wasn’t one student that thought that craters such as this one or even Victoria crater where more than 100,000 years old. Most said they would guess a couple hundred years to maybe 10,000 years or so. I had the student’s debate among themselves about how these rocks/craters came to be eroded and they all concluded it had to be wind. But even after they convinced themselves it was wind erosion they found it very difficult to comprehend that the age of even this somewhat fresh-looking crater is very likely to be 100,000 years and probably more than million years old. In the case of Endurance (above) and Victoria craters an age of 500 million years may still be an underestimate. My students, many of whom were engineering majors, really thought it would only take a 1000 years or so to erode the rocks in the pictures above. As the class proceeded, I discovered that only one of the 18 students was sympathetic to a young-earth creationist’ perspective. So the student didn’t have a bias against thinking the Mars was billions of years old. They simply just couldn’t fathom the time required for wind to cause this action. Throughout the course we came back to these craters. We looked at the evidence for present and inferred past wind speeds on Mars. Then we asked basic questions about how much dust could be held in that wind given different air densities, the friction that dust would cause when striking a rock and so forth. Finally the concept that the rate of erosion on Mars is very low and the time then required to shape any of the rocks that we see through the eyes of the rovers is quite considerable. I’ll never forget the initial utter disbelief of these students that this landscape could be ancient. It was a big reminder to me that many of the concepts in science that are so obvious to scientists are not obvious to the majority of the public. Creationists like Ken Ham can use these common misconceptions to their advantage because they can simply confirm to their audience what they probably already think that these features can all be squeezed into 10,000 years or less because that is a really long time.